Vendor Booth Registration is Open. The Southeast Texas Bridal Fair series is coming to the Holiday Inn & Suites Beaumont Plaza. Are you a Southeast Texas wedding vendor? This is a great chance to get in front of local brides. The event is sponsored by SETX Weddings. Their site SETXWeddings.com essentially provides a year round online Southeast Texas Bridal Fair experience. For brides – and wedding vendors – it is nice to reinforce the online bridal fair with live events, giving brides and wedding vendors the chance to talk face to face. The SETX Weddings bridal fair series gives brides and local wedding vendors this opportunity. Secure your place now – this is an intimate bridal fair experience and space is limited. Vendors at this event will have a great deal of one on one time with Southeast Texas brides – the event is designed to give brides quality time with each vendor rather than rushing through the event. Click here for the Beaumont Bridal Fair Facebook Event Page. Are you looking for engaged face time with Golden Triangle brides? Meet them at the Beaumont Bridal Fair! Would you like to be one of the select Southeast Texas Bridal Fair vendors? Click here to register online as a vendor for the Beaumont Bridal Fair. Brides will appreciate the chance to meet you in person – and to begin the process of planning their weddings. Do you have questions or special needs as a vendor for the Beaumont Bridal Fair? Call or e-mail today. Daryl Fant, Host. Southeast Texas Bridal Fair Series. You can book more weddings this year. Can’t make it to this edition of the Southeast Texas Bridal Fair Series? No problem, SETX Weddings will look forward to having you at the next one. They would also love to tell your story on SETX Weddings. After all, SETX Weddings is the online bridal fair for Beaumont and Southeast Texas, 365 days a year. Be sure to ask about their Southeast Texas Search Engine Optimization service. No one does more to make it easy for Beaumont area brides to find your services online via Google Searches, Facebook, Twitter, and Instagram. 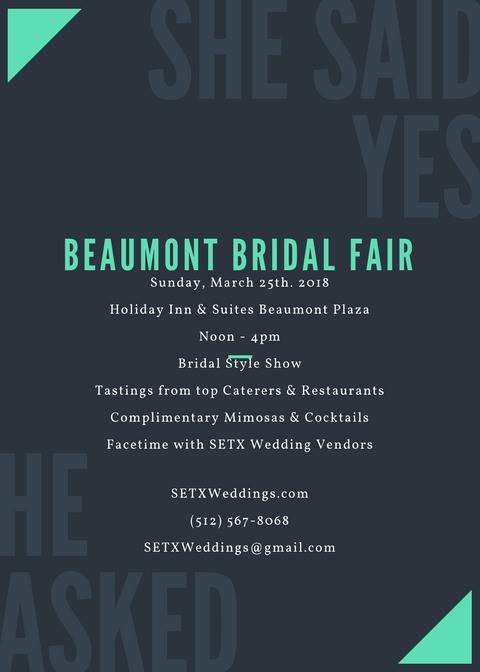 Thank you everyone – SETX Weddings looks forward to seeing you for a special Southeast Texas Bridal Fair at the Holiday Inn & Suites Beaumont Plaza. We look forward to helping you book more Golden Triangle weddings.